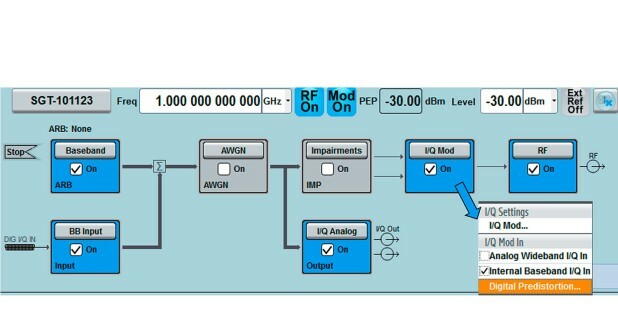 The R&S®SGT-K541 Option Digital Predistortion enhances the R&S®SGT100A Vector Signal Generator with the capability to apply predistortion in realtime. 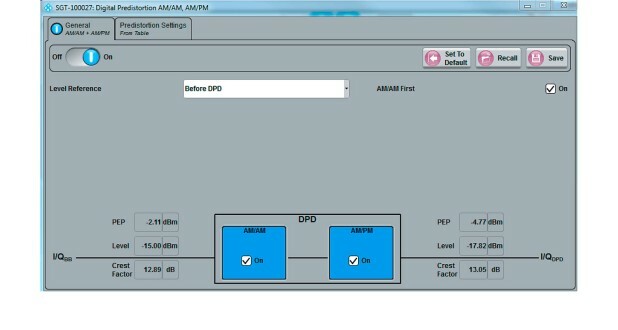 Realtime approach enables an automatic recalculation for different power levels and therefore eliminates the need to manually recalculate the original waveform . Power amplifiers (PAs) operated for high efficiency are driven close to or even in saturation which causes distortions. The results of these nonlinear effects are spectral regrowth outside the band and increased EVM due to distortion within the band. A widely used technique to compensate occurring distortions when operating the PA in the nonlinear areas is digital predistortion. Predistortion values can be loaded to the instrument in the form of AM/AM and AM/PM table. The R&S®SGT100A then applies in realtime the amplitude and phase correction to each complex IQ sample. This enables the user to quickly verify the effect of predistortion also over various power levels without manual recalculation of the original waveform file.